GraphQL has become a go-to API implementation for developers looking to take advantage of features liketype safety, network efficiency, real-time data with subscriptions & more. Building, managing, & deploying your own GraphQL server can be tedious & time consuming, especially for developers new to the technology that may want to quickly get a real-world, secure & scalable GraphQL API up and running without having to learn how to create it from scratch (as well as spend the time learning best practices around API design & authorization). 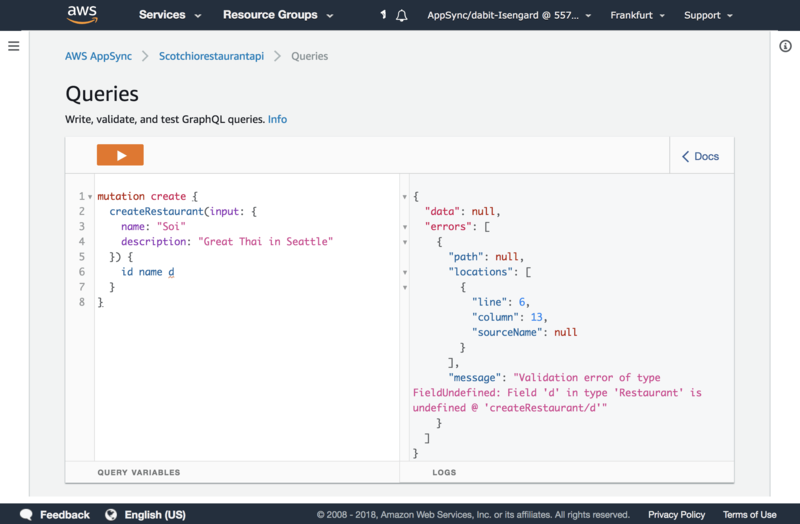 In this post we&apos;ll learn how to use AWS AppSync, a fully managed GraphQL service, to create a serverless GraphQL API. AWS AppSync allows developers to quickly create serverless, scalable & secure GraphQL APIs. We&apos;ll be using AWS Amplify to create the AppSync service & connect to it from our React application. AWS Amplify is a CLI & Client toolchain that allows developers to create AWS services from their front-end environment & connect to them from the client-side applications. The app that we will be building is a restaurant tracker app that will allow us to keep up with all of the restaurants we would like to visit as well as store information about each restaurant. We&apos;ll use React as the front-end for the application. The AWS Amplify CLI is the tool that we will be using to create the AWS AppSync API. This CLI allows us to create & deploy AWS services directly from the command line. The services that we will be creating are AWS AppSync for the API layer & Amazon Cognito for the authentication provider. Users will be able to sign up for an account, sign in to the account, create a restaurant, & query for only the restaurants that the user created. Here, you will be prompted with questions about your application configuration. You can choose your default text editor and the defaults for all of the other options. Once the project has been initialized, we can go ahead and add an an API & authentication to our app. To do so, we&apos;ll first add authentication. Once the push is complete, the AWS AppSync service have been successfully created in our account. What exactly has been created? If you notice, in the above schema definition, we have an @model directive on the schema type definition. This is part of the Amplify GraphQL Transform library. The library will recognize this directive & automcatically expand the schema into additional schema that is typically necessary for a robust API, including queries, mutations, subscriptions, resolvers & a data source (Amazon DynamoDB). Everything you need to get up & running is now set up for you using this directive. If at any time you would like to view the services that have been created in your Amplify configuration, you can run amplify status. To view the AWS AppSync console & see the API that was just created, click here. To view the Cognito user pool that was just created, click here. Make sure that you are in the same region in which you created your resource by viewing the region in the top right corner of the AWS console. Now that the API has been created, we can go to the AWS AppSync console & begin testing it out! To do so, visit the AWS AppSync console (be sure you are in the correct region), & click on the API name you just created. In the left hand menu, you will see links for your data source, settings, schema, & queries. Feel free to click around here & explore. This query should return an array of restaurans showing the id, name & description for each item created. You may be wondering where the ID comes from, since all we did was pass in a name & description. The ids are automatically generated by the service (in the resolver mapping template) so you don&apos;t have to pass them in. If you&apos;d like to view the mapping template for any resolver, click on Schema in the left menu, look for the resolver you&apos;d like to view in the resolvers panel on the right. Now that the services are created, we can wire them up with our React application & begin interacting with them. Display the restaurants array in the React application. In componentDidMount we fetch the data from the AppSync API by using the API class, calling API.graphql passing in the graphqlOperation helper & the query definition. We the store the data in the restaurants array after it has returned from the array & reset the state. For the final gist of all of the code for this component, check out this link. Now that we know how to query for data, let&apos;s look at how to submit mutations & create new items in our API. To do so, we&apos;ll create a form with an input that will create new items in our API & display them to the screen. We first check to make sure the form input values are not empty. We then create a new object called restaurant & store the name & description values in the object. Next, we create a new array called restaurants & set the value as a new array containing all previous restaurants in the state as well as the new restaurant object. We call setState to update the UI with the new restaurants array & reset the form fields. Finally, we make the API call, passing in the restaurant variable to the API.graphql graphqlOperation as a variable. For a final gist for all of the code for this component, click here. As I mentioned in the introduction, one of the most powerful features of GraphQL are real-time data with subscriptions. Subscriptions push data from the server to the clients that choose to listen to the real time data coming from the server. We can subscribe to the creation of a new item, in our case the creation of a new restaurant, & get notified of the creation of the item as well as receive the item data in the subscription callback. We create a variable to store the restaurant data coming through the subscription. We create a newly updated restaurants array, filtering to make sure there are no duplicate items in case our application is the app creating the mutation. (This implementation checks for duplicate name & descriptions. Ideally, you would have a client ID in which to filter on also stored in the database which would serve as a proper way to filter duplicate items). After the restaurants array is created we reset the state with the new restaurants array. In this tutorial we&apos;ve walked through all of the typical GraphQL operations you would use in a real-world application. We&apos;ve also built & deployed a real-world GraphQL API that will automatically scale for you as your application scales. The only data source we&apos;ve looked at so far is DynamoDB, but AWS AppSync also supports other data sources out of the box (including Amazon ElasticSearch, AWS Lambda, & http resolvers). If you&apos;re interested in learning more about using other data sources, check out the documentation here.